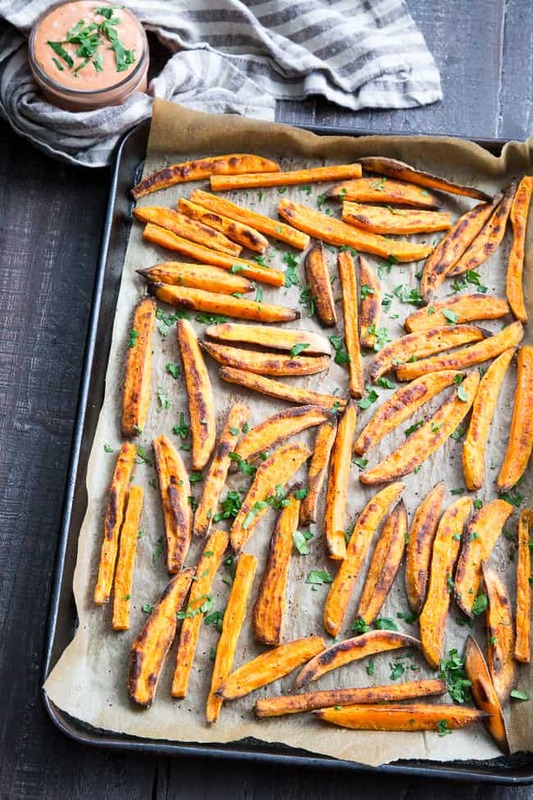 Crispy baked paleo and Whole30 compliant sweet potato fries are not only possible, but easy to make, too! 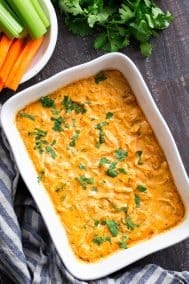 Served here with an insanely tasty, Whole30 compliant BBQ ranch dip that you’ll want to put on everything. Kid approved, great for a fun snack, side dish, or appetizer any time! 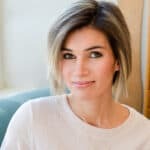 What makes paleo (and the Whole30! Which I’m on day 27 of now!) special, tasty, and ultimately more satisfying than anything before? It’s recipes like these – the ones that are just so good they almost seem too good to be true. And, so good, that you almost want to keep them a secret. But no, I’d never do that to you. I’m all about sharing my secrets when it comes to making Paleo feel indulgent. And no – this is not difficult stuff, but did require some practice and trial/error on my part before getting it oh-so-right that it feels wrong. So, what am I going on about? 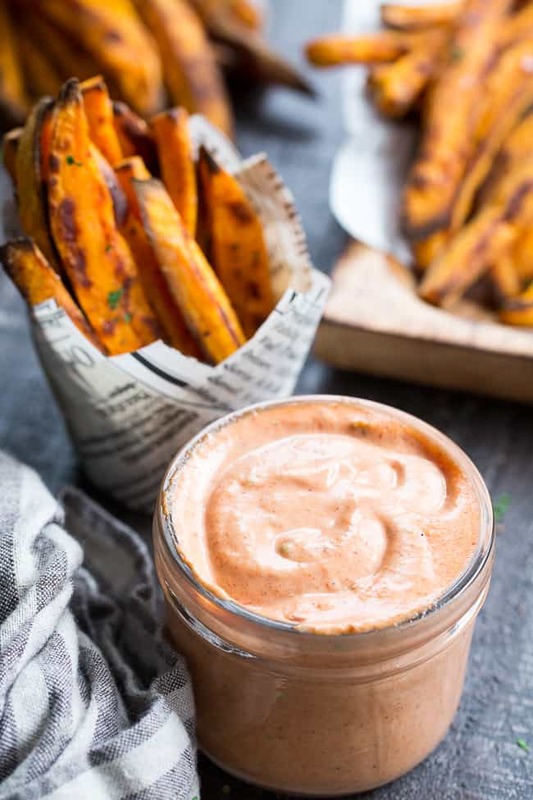 Oh, you know, fries and dip – the stuff that all your paleo and Whole30 dreams are made of. 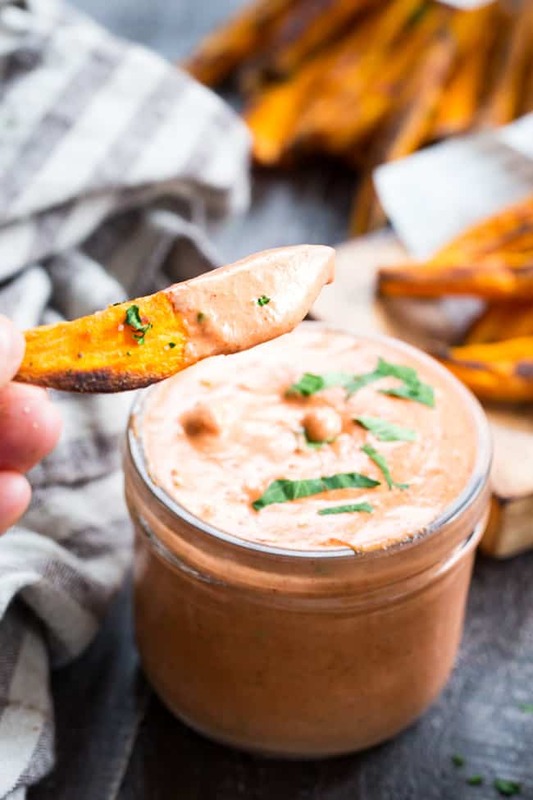 It’s not like this is anything new – if you’ve been following me for a while (or even a week) you probably know that I partially live on veggie fries + dips. 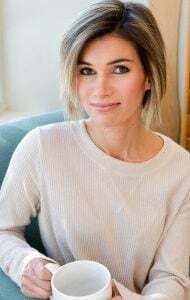 But, you see, when I first started paleo, I set out to make baked fries, and well, they came out not just soggy, but lacking in flavor and basically everything else you’d want in a fry. Let’s just say I knew I was missing something, and I wasn’t about to give up until I figured it out. And dip? I didn’t even know paleo and Whole30 dip was a thing back then. My, how far we’ve come! 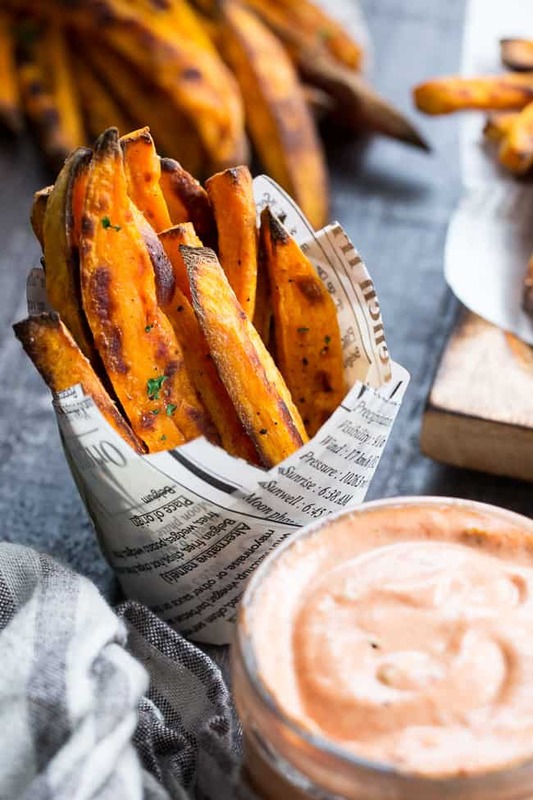 You see – I’m ALWAYS trying to improve my method for making sweet potato fries, since, as I mentioned, I live on them – plus – they’re basically the only way my 6 year old eats any veggies. Quality control is important over here when it comes to baked veggie fries! For example, I used to think that cutting fries SUPER skinny would make them crispier, but honestly, I like them just a little thicker to accentuate the contrast between the crispy outside and soft, sweet, caramelized inside. I also tweaked the oven temperature (450 versus 425), and, when you’re making a ton of them, I learned to change the position of the baking sheets in the oven halfway through to help them brown more evenly. Nothing gets me more frustrated than half my fries burning while the other half is barely soft. Ugh. No need to take notes though, because all the instructions are in the recipe itself – phew! All those tips I’ve gathered over the years DO add up, so it’s all spelled out for you with precision. Now, for the dip. I made BBQ sauce a few weeks back and decided to mix it with my ranch dip for fun, and WHOA! SO GOOD! But, instead of forcing you to make two separate dips and then combine them (too much work!) 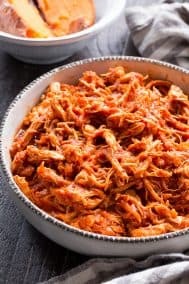 I developed a recipe that gets us straight to the BBQ ranch in just a few minutes. Just a note – don’t be intimidated by the homemade mayo because a.) 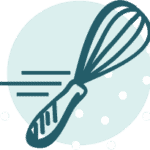 It’s ridiculously fast and easy to make with an immersion blender, and 2.) you can actually use store bought avocado oil Paleo mayo if you aren’t a fan of making homemade. That said, the homemade mayo version tastes BETTER, and might be worth the small learning curve! You can find my 2 minute homemade mayo recipe here. Seriously, this BBQ ranch has become my new favorite to dip may fries and veggies in, top my burgers and chicken and I’m not sure how I lived without it. Yup, I say that about nearly every new dip I create, but hey, I’m passionate about my dips and sauces and it’s just the TRUTH! 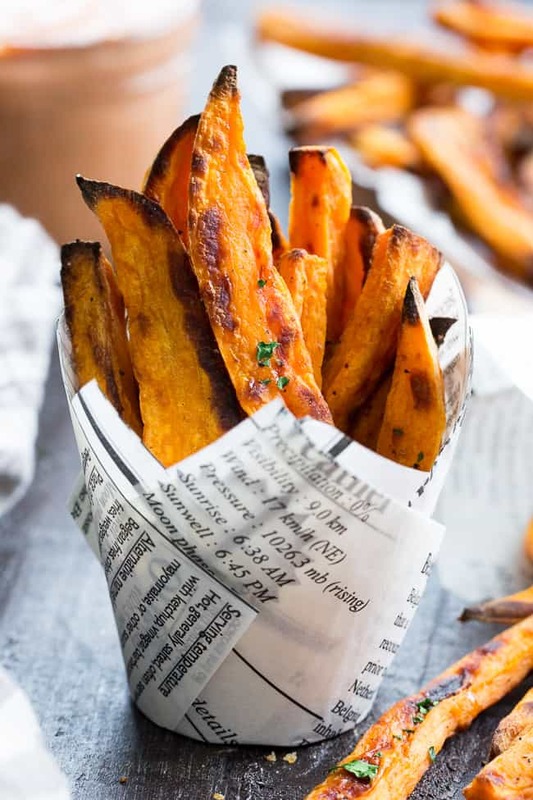 So, let’s grab our sweet potatoes, get ourselves together and preheat the oven – I promise you won’t be disappointed – now let’s make these fries! 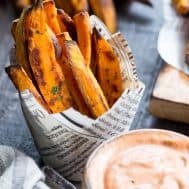 Crispy baked paleo and Whole30 compliant sweet potato fries are not only possible, but easy to make, too! 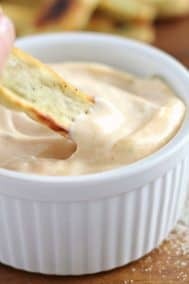 Served here with an insanely tasty, Whole30 compliant BBQ ranch dip that you'll want to put on everything. Kid approved, great for a fun snack, side dish, or appetizer any time! Preheat your oven to 450 and line 2 baking sheets with parchment paper. Cut the peeled sweet potatoes into fry shapes 3-4" long and 1/2" thick. Place cut sweet potatoes in a bowl and toss with the oil (or ghee) and sprinkle all over with salt and pepper. 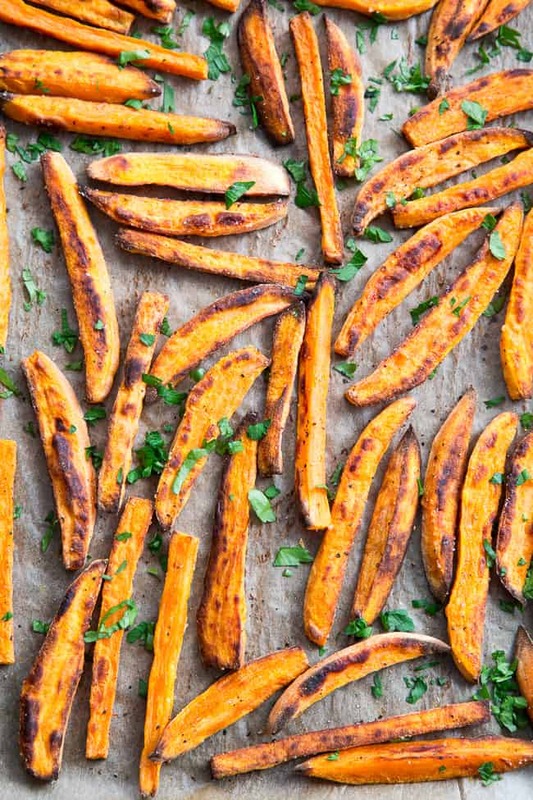 Arrange on the baking sheets in a single layer with no two fries touching - this will help them roast up crispy! 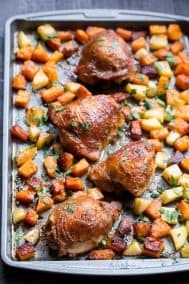 Place baking sheets on racks in the upper portion of your oven, and roast for 20-25 minutes until bottoms are browning (fries on the bottom rack will brown first), flip the fries using a spatula and return to a single layer. Rotate baking sheets 180 degrees AND switch oven racks (bottom sheet moves to top, top to bottom) to promote even browning. Meanwhile, in a high speed blender or food processor, blend the first 5 ingredients until smooth. Leftover dip can be covered and refrigerated for up to 3 days. Enjoy! *If you aren’t serving right away, you can keep fries crisp in a 250-300 degree oven until ready to serve, no more than 20 mins. 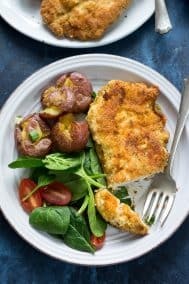 To reheat/re-crisp the leftovers, place on a parchment lined baking sheet in 325 oven until hot and crispy. 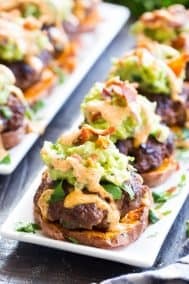 Want More Paleo and Whole30 Appetizer and Snack Recipes? Try One of These! I made baked/broiled white sweet potato fries this morning as a base for sautéed zucchini and kale. Yum! 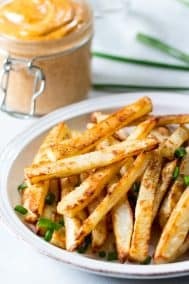 I’d love to try using the leftover fries with the BBQ Ranch Dip, however, do you have any suggestions for making the BBQ sauce or dip nightshade free? Unfortunately I’m not sure what to sub in for that! 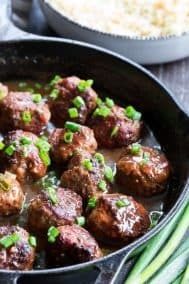 My husband killed it on whole30 (down 24lbs!) But is big time missing some of his favs… He found this recipe and asked me to make it, so yum! Omg! Made these tonight along with the dip and my husband instantly wanted another batch. Between the sweetness of the fries and tang of the dip… heaven in your mouth! We have been thrilled with everything we have tried so far! Thank you soo much! Awesome! I’m so thrilled you liked it! Is the nutritional information with the dip or without? Thanks!